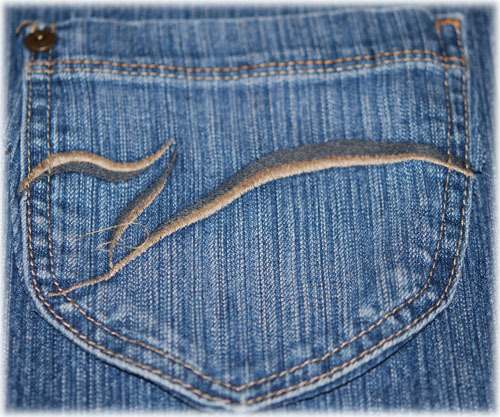 I liked the stripy look of these old jeans (I also like the fact that I got smaller and couldn’t wear them!). So, I cut this leg off about mid calf. 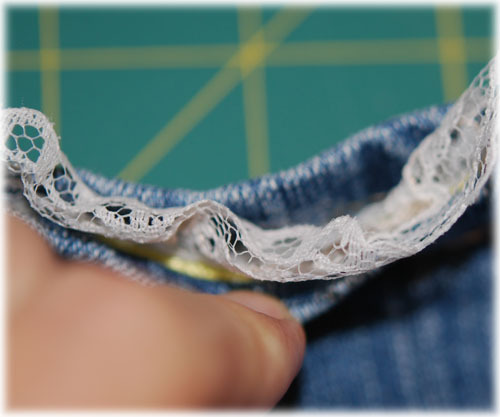 Be sure you cut it bearing in mind that you are going to need a little extra to turn under for your top casing to put your ribbon drawstring in and also to sew the bottom closed. 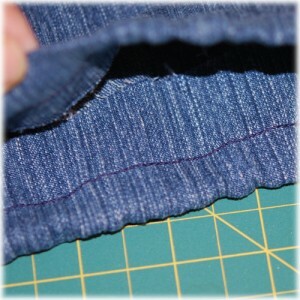 Better to cut it longer than you think you will need and cut off the excess than to discover you have cut off too much. *I want to put in a plug for good dressmaker scissors. My Mom bought me a pair of Ginghers about 30 years ago. 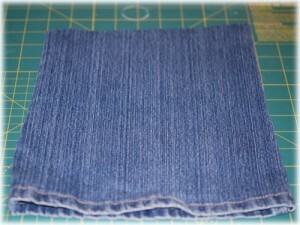 I have never cut anything but fabric with them (Mother taught me that!). They have never been sharpened and they cut thru fabric like butter still. They are well worth whatever they cost today. 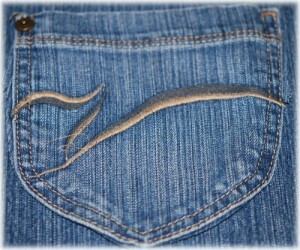 Next, cut out a back pocket from the same pair of jeans. I liked the little design on this pair. If you have a plain pair you could do your own design too, if you felt a little energetic! Of course there are some really cute appliques or you could paint or… you get the idea! 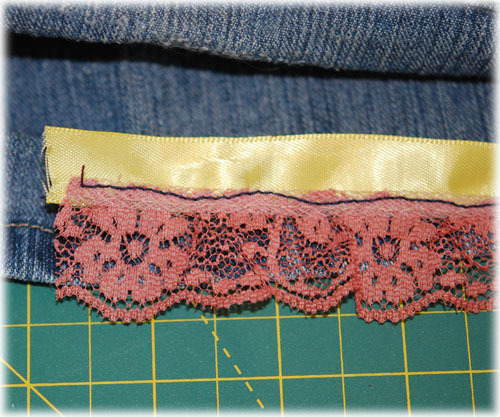 Next, I wanted a piece of lace to peak out the bottom, but the lace I wanted to use was too short to stitch in above the hem from the leg and still stick out much. So, I had the idea to stitch it to a piece of ribbon first and sew the ribbon in when I sewed the bottom of the purse together. You can see in the picture that I ended up using a different lace, as I changed my mind about this one(fortunately I decided that BEFORE I stitched it in!). But you get the idea. I did just a straight stitch with my machine, and it didn’t matter what color since it wasn’t going to show. I like the look of denim and lace together, and I liked the ease and look of using the already sewn seams of the jean’s leg. I thought I could affix it with some of that fabric glue that works with heat or the webbing that does the same thing, but both of those don’t seem to work for me. I would love someone to give me some pointers on those. But more on that when I get to the pocket. Anyway, all of this was stitched, but it was easy. Next, I hand stitched a piece of lace on the front of the pocket (careful, don’t stitch the pocket closed!) and wrapped it around the back about half an inch or so on each side. Now, I thought I could use that fabric glue that you then iron and it sticks forever and you can wash blah blah blah. Well, no, it doesn’t! Didn’t work at all. 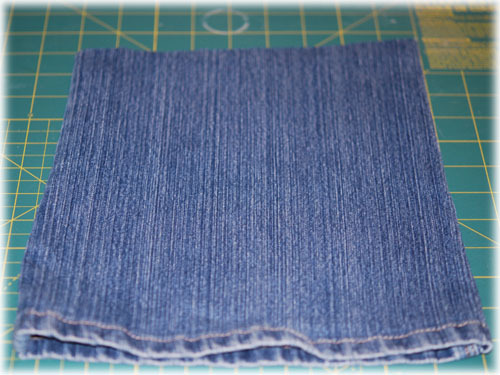 So, I was able to very carefully sew the pocket on with my machine (hard to do when you’ve already sewn the bottom up –I recommend you do this first, but it’s still hard to do on a pant’s leg to be honest, however, you CAN do it. Just use patience, this is good character building. 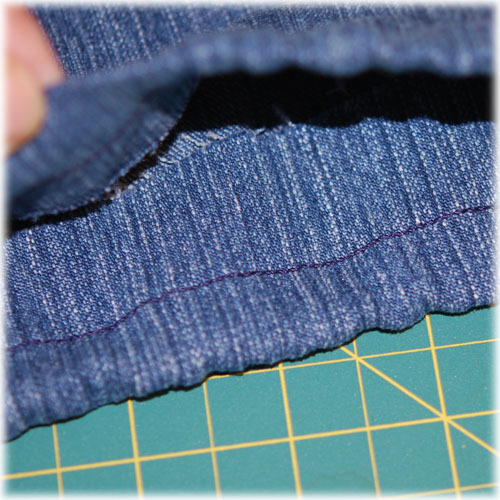 I did have to hand stitch a little bit around the metal brad and the edge of the inside of the pocket (remember, you do have to stitch the fabric from the inside of the pocket down or your pocket is just a big flap hanging there). I can’t explain this very well, see the photo. Now, you need a way to close the purse. I wanted a drawstring. I was going to use a cord, but I didn’t like anything that I found, so I opted for some pink ribbon which I had bought to do something else with (which I didn’t end up doing) and liked it better. I like when that happens. Very simple. Sew a casing (which is really just a hem) around the top big enough for the ribbon to run through (don’t make it too small or it will be too hard to draw). Before you do that tho, here is the fun part. 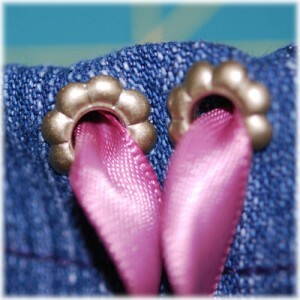 You need an eyelet tool. I had to make a trek to JoAnn’s Fabric’s because no one sews anymore so there are no places nearby that carry things you need. That’s ok, I got to see all sorts of cool fabrics AND I bought a few things to make some things I have wanted to make (that means more upcoming blogs!). But, I’m off track. 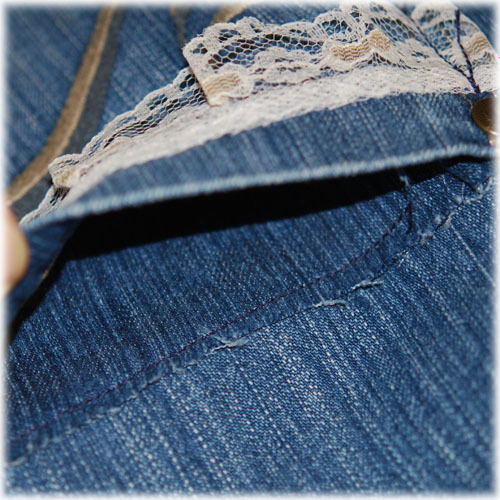 If you don’t know how to use an eyelet tool it’s way simpler than you think and really fun because you get to make a hole and then squeeze something really hard and in the end you have something really fun. I think I’m going to do another purse with a bunch of eyelet things for a closure because I bought these really cute eyelet things and I need to use them. Anyway, I put 2 in this one and ran my ribbon thru them. I also didn’t want just knots int he end to keep the ribbon from fraying and I also hate when drawstrings run into the casing and you have to fish it out so I found some cute beads in a bracelet set at JoAnn’s and put those on the ends. I put a drop of hot glue on the end to make sure they stayed in place, otherwise is am sure that with all of the tugging they get they will come off. Hopefully that will keep them where they belong. 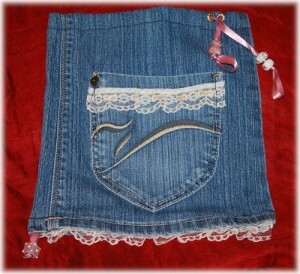 Then I realized there was a little gap at the bottom where the ribbon wasn’t quite as wide as the bottom of the purse. I don’t know how I missed that, but I thought, what now? Well, there’s always something you can do that can look like you planned it that way (unless of course you post it on THE INTERNET and tell everyone). So, I took a piece of the pink ribbon, added the one bead that was leftover and sewed THAT into the gap and you know what? I thought it looked wonderful! I also gave it a little dab of hot glue to keep it safe, since I had the hot glue gun out and hot. Better safe than sorry. And those beads were SO CUTE! So really, that’s it. All I had left to do was clean up loose threads and take pictures and feel pretty smug. 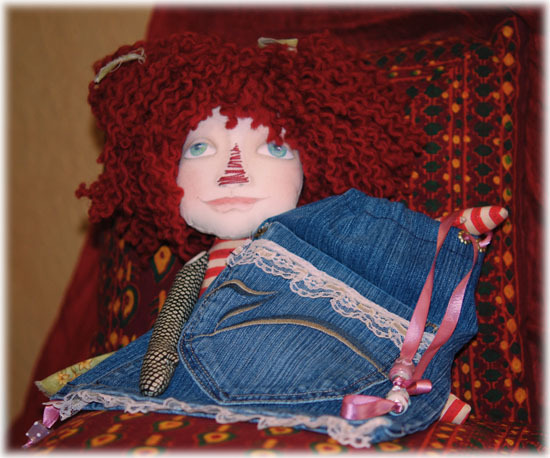 I just LOVE making these little jean purses, and they are a pretty fun way to learn to sew. I’m sending this one off to my Great Niece. I hope she likes it. It’s so cute Susie – I love it! 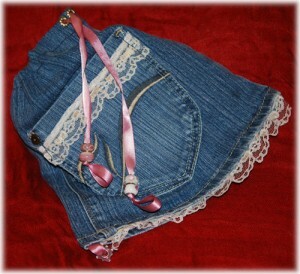 I do love the mix of denim and lace. Your photos are also fab – brilliant close-ups. I’ve been playing around with denim, lace and buttons this week, it all looks so good together. Your tutorial is really easy to follow, thank you. My God, you’re very creative !